Show bootloader menu. 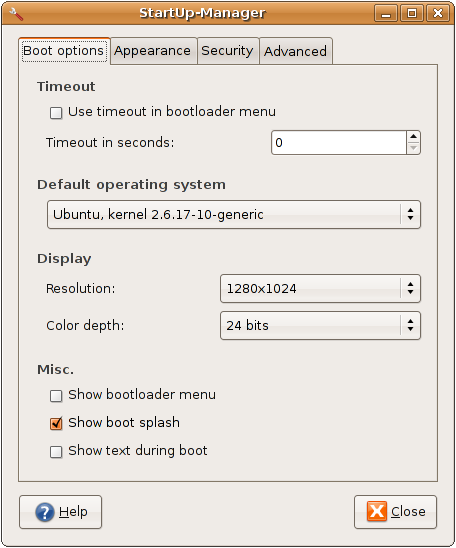 When selected the bootloader menu displays available options such as kernels, recovery modes, memtest86+, and other operating systems, if installed. If this option is not selected, no bootloader menu will be displayed during boot. The default or saved OS selection will be used. Show boot splash. Enables the splash screen viewed during the boot process. Manage bootloader themes. Add or remove an installed bootloader theme. However, nothing makes the boot messages go away, starting with "Reading files need for boot" and then listing a whole bunch of information such as setting up the firewall etc, which drivers are loaded etc. Is there any other approach I could use? To disable boot messages, you need to pass the quiet option to the kernel at boot time. This is usually done by editing the grub configuration file at /boot/grub/menu.lst. Detailed descriptions on exactly how to go about this on Ubuntu can be found in the Ubuntu wiki. Note that you are NOT supposed to uncomment the # kopt=<options go here> line, as all the commented lines in the menu.lst file is parsed by update-grub, which modifies the kernel entries further down in the file accordingly. Alternatively, you could run Karmic, it has one built in and it's pretty much a Release Candidate now. Dual boot Windows 8 and Ubuntu?